When I finally did go, I was entranced. 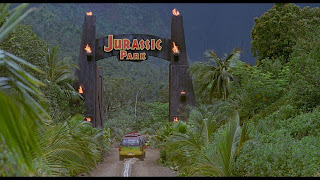 Jurassic Park earned a place in special effects history for blowing the computer-generated doors wide open, but impressive visuals aren’t the film’s only achievement, nor are they its greatest. Adapted from Michael Crichton’s spellbinding novel, Jurassic Park tapped into wonderment, the awe that swells up as you stand before a towering skeleton in a museum and dream. Many talented filmmakers left fingerprints on the project, but Spielberg’s touch made it a masterpiece. Entrepreneur John Hammond (Sir Richard Attenborough) invites dinosaur experts Alan Grant (Sam Neill) and Ellie Sadler (Laura Dern), along with renowned mathematician Ian Malcolm (Jeff Goldblum), to visit and hopefully endorse his latest business venture: Jurassic Park. Constructed on an island off the coast of Costa Rica, Jurassic Park features living dinosaurs cloned from preserved DNA strands. After a power failure allows the dinosaurs to escape their paddocks, what began as a wondrous vacation becomes a desperate fight for survival. Until it was dethroned by Titanic in 1997, Jurassic Park was the highest grossing film of all time, and it set the stage for the effects-heavy blockbusters that would rule the 90s, though few were as memorable or as well-executed. Jurassic Park began production with stop-motion effects; the technology for computer generating the dinosaurs was developed in house during production. Younger moviegoers who have grown up with CGI might have a hard time grasping the magnitude of the achievement; audiences had never seen anything like it before. Some filmmakers became overly dependent on computer effects in later years (an unfortunate trend that continues to this day), but revisiting Jurassic Park, it’s refreshing to see the blend of groundbreaking and traditional effects used to bring dinosaurs to life. Twenty years later, Jurassic Park’s CGI holds up remarkably well, partly because Spielberg and his effects team didn’t lean on it too heavily. Take the spectacular T-Rex attack in the rain; what you see is a mix of computer effects and large-scale animatronics. When Grant leans against the sick triceratops, you can sense the creature’s physical presence. Dinosaurs’ pupils dilate and nostrils flare; close-ups on the practical effects help sell the digital ones. The effects team pushed the limits of the new technology but had an admirable understanding of how to use it sparingly and effectively. For its 20th anniversary re-release, Jurassic Park has been given the 3D treatment, a format I’m not a fan of, especially for a film shot in 2D and then converted to 3D during post production. That said, Jurassic Park features the best post-conversion I’ve seen, with impressive depth and tasteful, gimmick-free implementation. I can’t say the 3D added much to the viewing experience, but it didn’t detract as I feared it might. Few Michael Crichton novels have translated well to the screen, partly because the science and factual details that pull readers into his stories rarely end up in the film script. Jurassic Park spends just a few minutes addressing cloning and chaos theory, but those exchanges go a long way in selling the concept as semi-believable. The movie begins with a frightening attack on a construction worker but then relaxes into scientific intrigue and character development before jumping back into action. Few thrillers have Jurassic Park’s perfect pacing and emotional range. 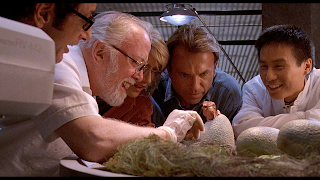 Memorable performances, expert direction, an iconic score from John Williams, and some of the best visual effects on record have helped Jurassic Park age gracefully over the last twenty years. Watching it again in a theater, I loved hearing children gasp as water rippled in the T-Rex’s muddy footprint and again as velociraptors hunted Lex and Tim in the kitchen (I couldn’t help but wonder if parents of younger children in the audience had the same concerns mid-movie as parents had in 1993). Jurassic Park still has claws, but more importantly, it still has magic. 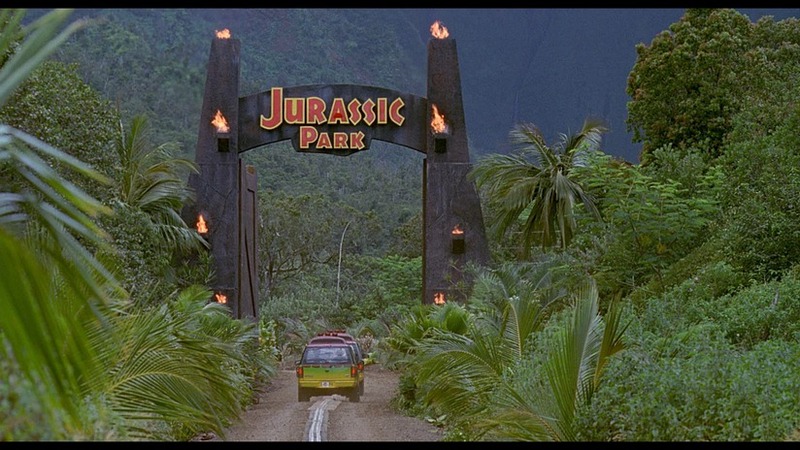 When the music swelled as Hammond welcomed his guests to Jurassic Park, I got chills all over again. Jurassic Park received backlash from parents in 1993 because of how heavily it was marketed to children. Young kiddos who walked in with their Jurassic Park happy meal toys walked out wide-eyed and traumatized. Nothing about the film has changed for this re-release, so you could preview it at home before taking your kids. If you don’t have time to re-watch it or just need a recap: a T-Rex picks a man up in his mouth and shakes him like a rag doll. At one point, you see a bloody severed arm. More concerning than the sparse onscreen violence, the dinosaurs themselves are often sharp-toothed and scary, with Spielberg consistently ratcheting up the suspense. Kids will react differently based on what they’ve seen and what they’re ready for; I loved Jurassic Park at age nine, but I was well prepared, having read the junior novel until the pages fell out. For those who have regularly checked in over the last couple of years, you may have noticed me writing less and less. If you’ve checked in over the last five months, you may have noticed me not writing at all. So where have I been? As it turns out, I’ve been writing a great deal, though the bulk of my attention has shifted to fiction. I’m putting more energy into my short stories and my novel (which I’m currently shopping around) than my reviews, so the content of this site has suffered. I apologize if you checked back during awards season, when new reviews should have been popping up constantly, to see that same “Skyfall” review from November. It was a fine film, and while I was pleased with my review, it was hardly good enough to hold down the fort for five months. That said, I’m excited to announce that some big changes are on the horizon. DeeTravis.com will soon receive a makeover to more fully reflect what I’m up to with my writing. A more comprehensive author page with biographical information and updates on my fiction writing are in the works, though my movie reviews will still be a feature. I’m planning to launch the new site later this year. Most of all, thanks for reading; your support means the world to me.